At the Society, we’re not just building an organization; we’re building a movement. 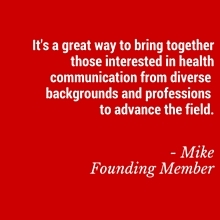 Our core activities are focused on making connections in the field, building a unified voice to shape the conversation around health communication, and sharing information and best practices. If you're a member of the Society, check out the Member Center for ways to connect with other members and join ongoing conversations around specific topics. If you're an interested individual, join the conversation on Twitter or get emails updates on other ways you can get involved.